In a workshop classroom, all authors are mentors. They are teachers of the craft of writing, and the foundation of the workshop model is built on acknowledging and celebrating them as such. All writers are apprentices of other writers–Stephen King notes this in On Writing, Katie Wood Ray points this out in Wondrous Words, and Penny Kittle champions this in Write Beside Them. This week, we’ve practiced treating two types of writers as mentors in our classroom–published authors and student writers. Once we set up our writer’s notebooks, we began filling them with all things personal to us. Heart maps, important photos, our hands, lifelines, reading histories, and more. Then, we turned to adding the words of other writers. I wanted to show students the power of other writers’ words. I wanted to teach them to read poetry not to “torture a confession out of it…to find out what it really means,” as Billy Collins writes, but to celebrate the act of simply reading that poem. So, we glued in an excerpt from Jacqueline Woodson’s Brown Girl Dreaming. I modeled for students how to respond to Jacqueline as a real writer, to notice and note her craft moves, to be inspired by her ideas and write more about our own feelings on those topics. We wrote atop her poem, prioritizing our responses, reactions, and ideas rather than some analysis or “dulling down” of her meaning. Responding personally and authentically to published authors will become an important part of our daily routine in our writer’s workshop. I have discovered that students know themselves as learners better than anyone else. They set goals for themselves and judge how well they reach those goals. They thoughtfully and honestly evaluate their own learning with far more detail and introspection than I thought possible. Ultimately, they show me who they are as readers, writers, thinkers, and human beings. So this weekend, I read my students’ writing like I read books. I noted beautiful lines they wrote, jotted down spiffy words they harnessed, and responded to thought-provoking ideas I saw them getting at. I asked them questions, wondered about their meanings, and looked very much forward to reading more of their words in the future. I will confer with students as I return their papers, and we’ll talk about how they might move forward with some of the topics, ideas, and stories they’d begun in these early writings. In our classroom, we consider our responses to published writing as important as the writing itself. The value of reading and writing lies in the interaction between the reader and the words, as Louise Rosenblatt describes. 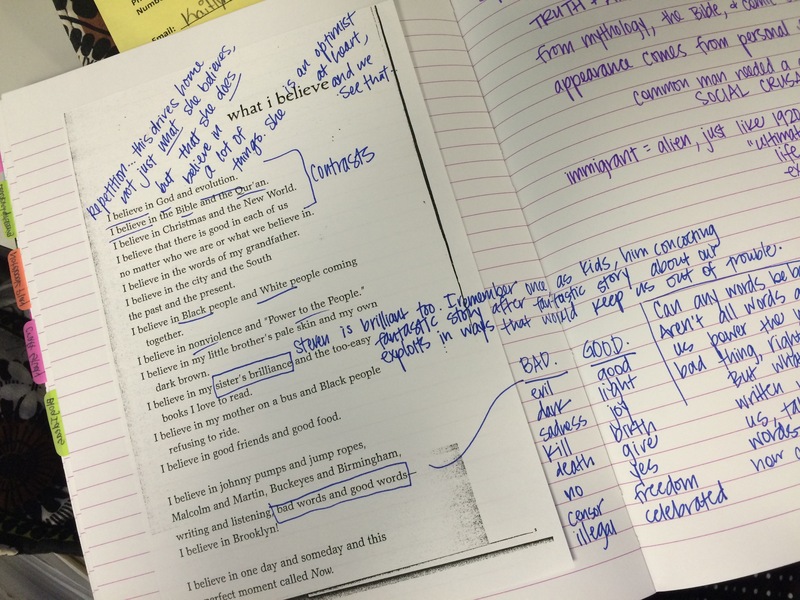 When I transfer that value from the way I want my students reading writing to the way I want to read my students’ writing, new and important opportunities for student learning occur. I’ve received a lot of feedback on my own writing lately, and I can vouch for everything you say here, Shana. The conversation around the writing can be as important as the writing itself. Thank you for this thoughtful post.